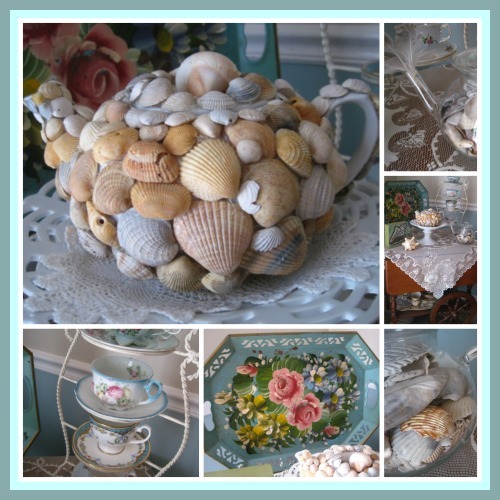 Actually, I'm not technically selling any seashells, at the seashore or otherwise, but I did decide to play around with some to add a bit of a beachy touch to my tea trolley this month. 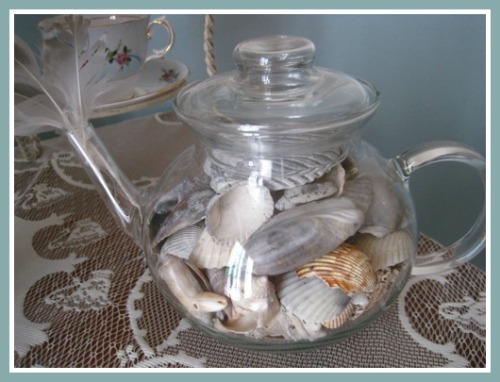 My favorite part of this display is always that plain white teapot to which I hot glued seashells some years ago. They're still hangin' on! And silly me, I had never thought of putting much of anything but tea in my glass teapot until I saw on Michele's blog one day that she was using hers as a candy dish to display Easter candy. A whole new world of possibilities opened up to me when I saw that photo. Really, what *can't* we display in a glass teapot? 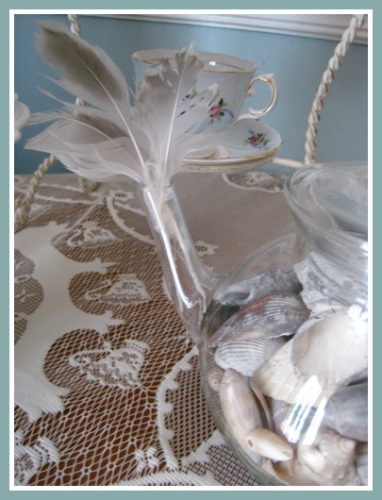 I collect feathers along with seashells when I find them at the beach, so the teapot's spout seemed like the perfect place to display a few. 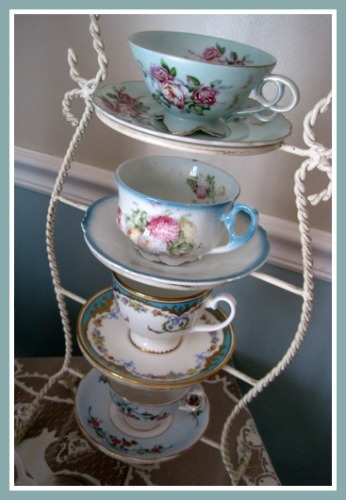 And of course some aqua and turquoise blue teacups seemed like just the perfect ones to display. 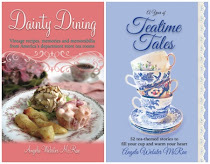 I am trying so hard to patch together a new vignette on the tea trolley each month, and I barely made it for June this year. Whew! 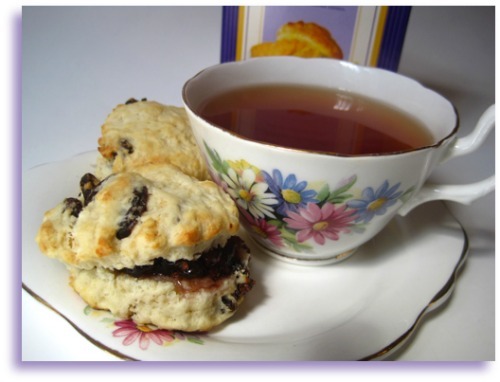 Earlier this year, I blogged about some "Downton Abbey" Scone Mix I received as a gift. After that post ran, I got a lovely e-mail from Garvey's, maker of the scone mix, letting me know this same mix is actually available year-round and offering to send me a sample of the mix, which of course I was only too happy to receive. Just as with the "Downton Abbey" mix, this one called for a half stick of butter, a half cup plus 1 tablespoon of milk, and that was all. 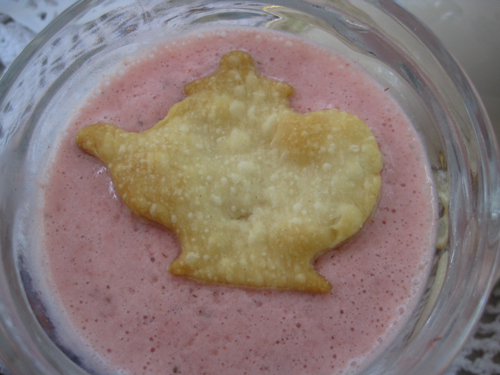 It mixed up super easy, and I had scones in the oven in under five minutes! One tip I learned last year, I believe, was to simply grate the cold butter instead of using a pastry blender to incorporate it into the scone mix. That speeds things up considerably, and the grated pieces of butter seem to stick to the flour quite nicely and evenly. I added raisins to the scone mix as per the Garvey's package suggestions, and again, these scones baked up nice and fluffy with a slightly crispy top. I spread my scones with some of the raspberry and jalapeno jam I first tried last week, and oh, they were delicious! 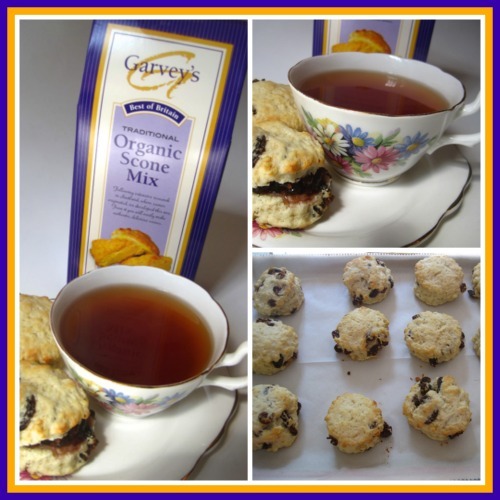 If you'd like to try some of the Garvey's scone mix for yourself, visit the company's website here or find them on Amazon. A summer thunderstorm had knocked the power out, and the thermostat showed it’d already crept up to seventy-nine in the living room. Fortunately, I had just poured myself a glass of iced tea, and that was what I sipped as I sat on the porch. It was still humid after that storm. Steam rose off the asphalt at the end of our driveway, and tree branches and leaves carpeted the path of the utility truck that had just pulled up at the Wilsons’ house down the street. I hoped we’d have electricity again soon. I held my glass up to my forehead and pretended its cold, icy surface was an ice pack. “Cooling off, which I highly recommend,” I told Mark as he headed up the driveway. I knew he was about to go investigate that utility truck. Since I taught seventh graders nine months out of the year, those summer days of freedom and no five a.m. wake-up alarms were precious indeed. That Friday morning, I left home and stopped by Starburnt—as Mark always called it—for a cup of chai and a scone, then got on the interstate and headed north. Soon, I spotted a billboard for the “South’s Largest Indoor Flea Market.” That would’ve been more impressive if I hadn’t visited before, because I knew the place was heavy on the fleas, light on the markets. Next, I saw a sign advertising “Mega Antique Mall, 200+ Booths.” The sign said it was just a few exits farther, and I needed to stop for gas anyway, so I got off there and followed the signs to the mega mall—only to find that it was mega closed. Sheets of plywood were nailed where the doors once stood. Back to the car, back to the interstate. I’d give it one more shot before heading home. The next billboard had a name I’d never seen before: “Benson’s Antiques — Exit 117 — Something for Everyone.” I got there in twenty minutes. When I pulled up, I saw that Benson’s appeared to be open, which I took as a good sign. Benson’s was no mega mall. The antiques were apparently sold in a rickety old Victorian house, its wraparound porch cluttered with rotting wicker, iron plant stands, and oak dressers with broken mirrors. Opening the front door, I peeked into what looked like hoarder heaven. I glanced around for the owner but spotted no one, so I started browsing the dusty tables piled high with cardboard boxes. Some old magazines caught my eye. One issue had a 1965 Thunderbird on the cover. Mark’s 1965 Thunderbird was his pride and joy, so I got him that magazine, which was only a dollar. I tucked it under my arm and headed to the next room. Surprisingly, the room had wall-to-wall shelves brimming with china and glassware. Whoever owned Benson’s obviously collected Depression glass, based on the many shelves of green and yellow plates, glasses, and bowls. 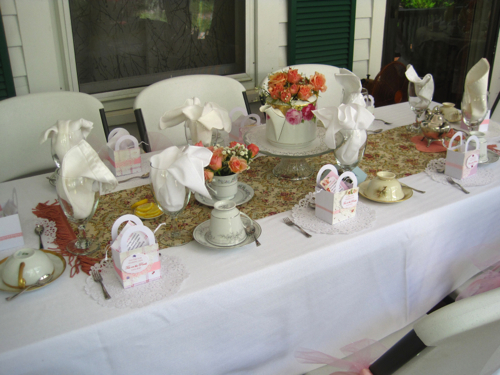 Prices were low, too—Depression glass pitchers for twelve dollars, bone china teacups and saucers for eight dollars. 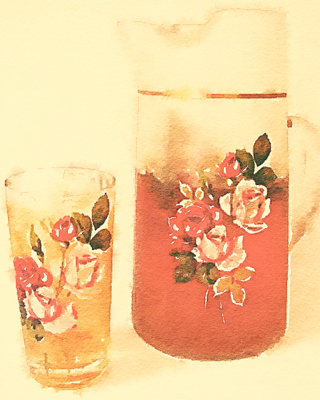 Scouring the shelves for something special, I spotted a vintage pitcher and glasses with pink and red flowers. I’d seen a set like that once and coveted it, but it was sixty dollars—too much. Benson’s set was just twenty. Was something wrong with it? I ran my finger along the rims of the glasses and pitcher but found no flaws. If only a “Benson” were there to take my money. I wandered into the next room, which was packed with linens and kitchenwares. I’d never seen so many canister sets before—roosters, cows, mushrooms. From the front of the house came the sound of the creaky front door opening, so I walked back up front hoping to find the owner. There stood a large, black-haired woman with a bouffant hairstyle and eyes heavily rimmed in black liner. She wore a fuchsia and green maxi dress, and bangle bracelets clanged on both arms. She was balancing two giant Styrofoam cups as she tried to close the door with her hip. “Let me help you,” I said, rushing over and closing the door. “Love it,” I said. “Had some on the way here.” I didn’t bother to explain that mine was hot chai. “B’lieve I will,” she said, taking a big slurp and fanning herself with an old copy of McCall’s before she began to write up my sales ticket. Jackie—as she introduced herself—wanted to know where I was from, what I collected, and what I planned to do with her old tea pitcher. She’d been in the antiques business for decades and liked to make sure her merchandise went to good homes. She carefully wrapped my purchases in newspapers she’d been saving since President Reagan was in office. What a character, and what a fun day. Mark walked down the driveway looking satisfied. The hum of the electricity turning on reached our ears at the same moment. “Want to head back inside?” Mark asked, holding the door. I looked at my iced tea glass and decided it was time for a refill. “B’lieve I will,” I said. I've been drinking lots of flavored teas lately, so it was a refreshing switch to get to sample some new green teas I recently received from Teavivre. I've gotten in the habit of trying at least two at a time, a method I like, as it seems to make the characteristics of each tea more pronounced when I compare one with another. 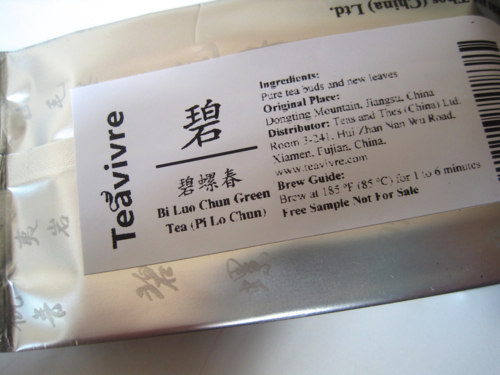 First was this Bi Luo Chun Green Tea. When I opened the sample packet, I got the scent of wood shavings with the surprise of a light floral scent. Steeped, the tea had a slight musky scent. When I tried this tea, I found it gave a rich, full mouth feel and no "grassy" taste as some tea drinkers find in green teas. I greatly enjoyed this tea! Next, I tried this Xin Yang Mao Jian Green Tea. 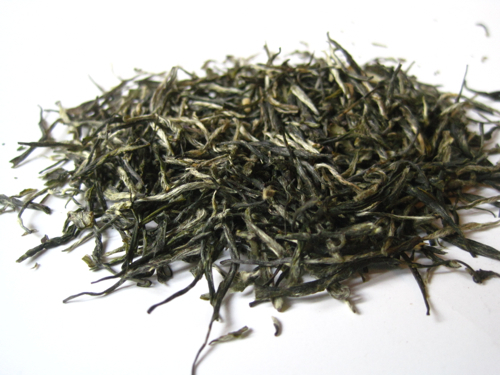 These tea leaves had a very wiry appearance and reminded me of dried grass clippings. The dry tea leaves had a vegetal scent. 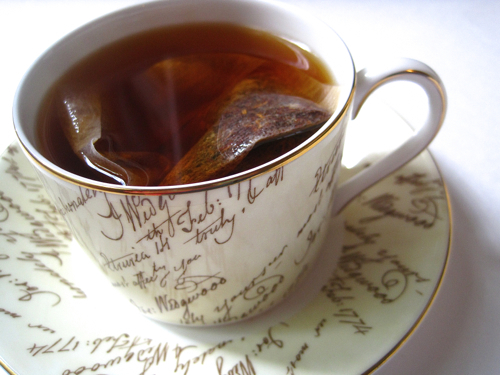 When I steeped this tea, I began to detect some faint smokiness. 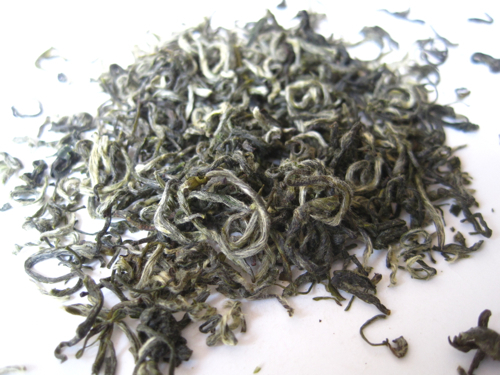 This tea, too, had a rich mouth feel, and I could taste a bit of the smoky quality, and it was quite enjoyable. 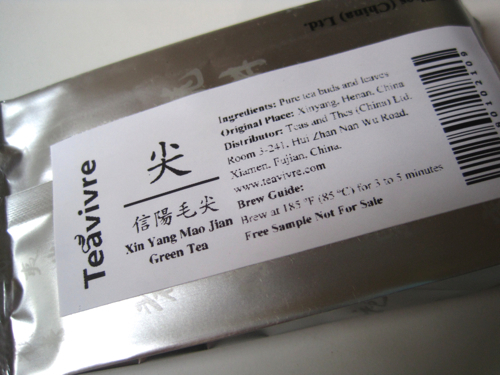 Definitely two thumbs-up for these two teas from Teavivre! 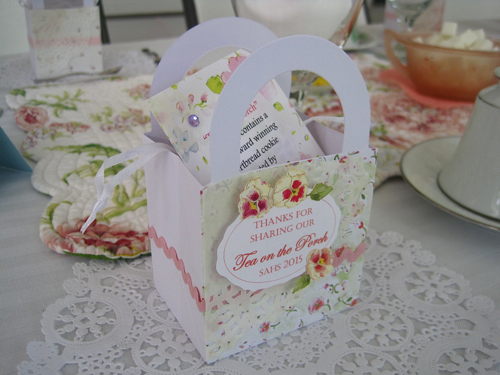 A lovely thank-you from the Senoia tea party! 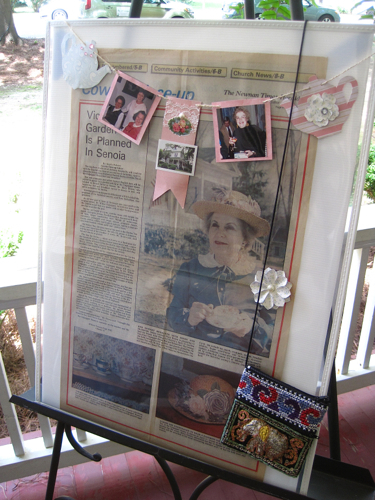 It's amazing to me that I got invited to attend a wonderful afternoon tea in Senoia, and then, simply because I served as a judge for their hat contest, I went home with a gift for doing so! But that's how eternally kind and generous those folks in Senoia are, so my friend Nancy Roy of the Carriage House in Senoia sent me home with a lovely gift bag of treats following the historical society's Tea On The Porch on Saturday. 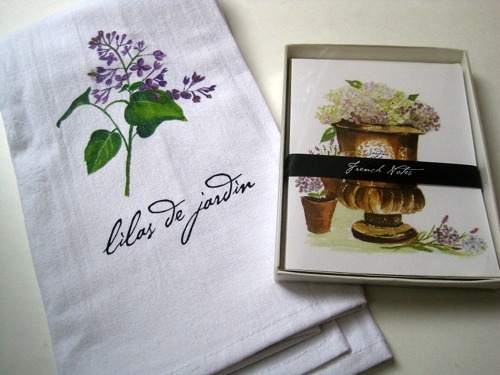 First, I learned that "lilas de jardin" means "lilac garden" in French after receiving this charming tea towel and notecards. 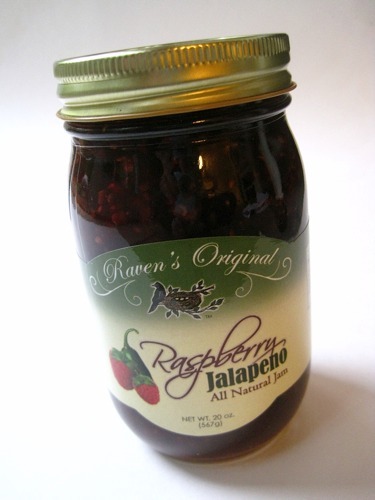 Next, there was a jar of Raspberry Jalapeno jam, and it is just delicious! As I suspected, it's heavy on the raspberry and light on the jalapeno, which is quite a fine combination. I enjoyed it on toast and may have to try this on scones next. 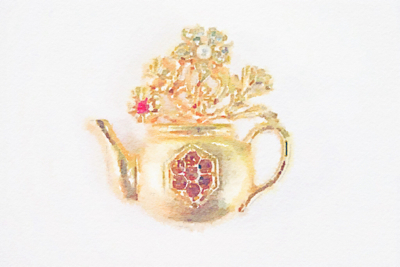 Finally, I received a most welcome addition to my collection of tea jewelry! 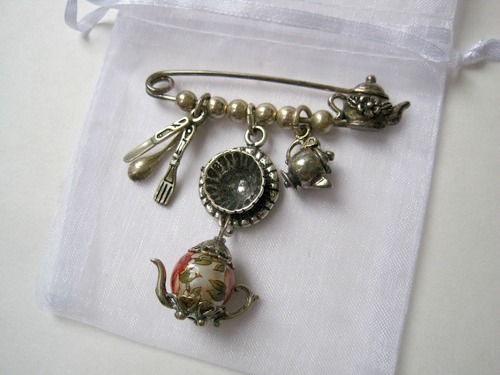 I've seen this style of pin before but never actually owned one, and I'm so happy to have a new piece of teatime jewelry, especially one that will remind me of a lovely afternoon of tea on the porch in Senoia. 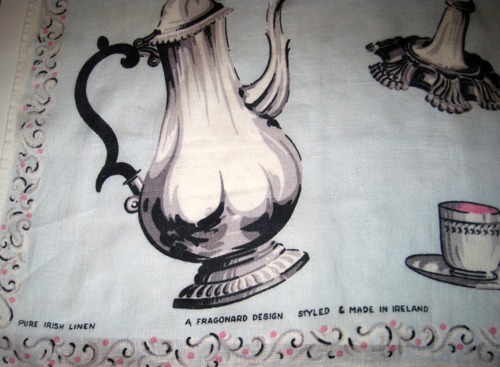 Some new Irish linens - "A Fragonard Design"
So I was reading my friend Liz's blog the other night, and she was writing about going junking in Atlanta, and then I came across this line: "I bought two dishtowels for Angela from a lady who brought them back from Ireland." Well, I figured that Angela could only mean me, and when we met up a few days later, she had the tea towels waiting in her car for me. It had not occurred to me they would actually feature teawares! I love the pretty aqua-colored towel for its design as much as its color. I don't believe I've seen this sort of labeling before: "Pure Irish Linen, A Fragonard Design, Styled & Made in Ireland." 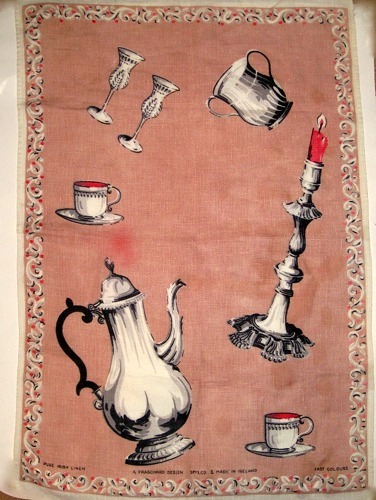 Liz noted the peachy-pink tea towel was stained, but she got it anyway, and I'm glad she did. I'll try to get the stain out, and if that doesn't work, the tea-ish parts could probably be upcycled into something else. 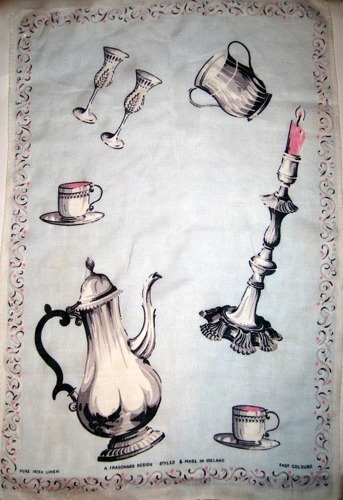 I looked for a little information online, but all I can find is that Fragonard tea towels seem to date to the 1950s and 1960s. If any of you tea towel experts have more info, I'd love to hear it! 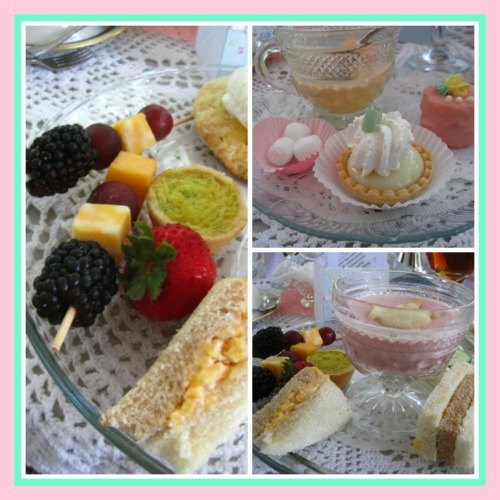 It would be fun visiting with the lovely people in the Senoia Area Historical Society even if they were not hosting their annual afternoon tea, but it's certainly a fine treat when they do! 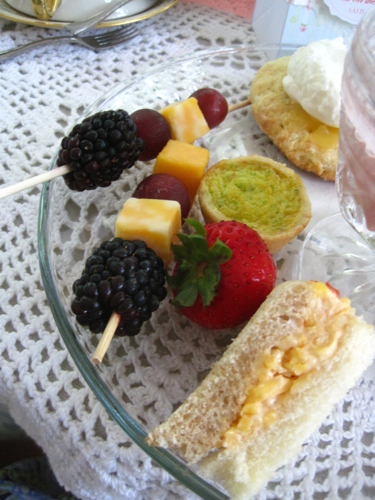 The menu was different from last year and included cucumber and pimiento cheese finger sandwiches, a mini quiche, fruit and cheese skewers, a chilled strawberry soup, and scones with cream and lemon curd. 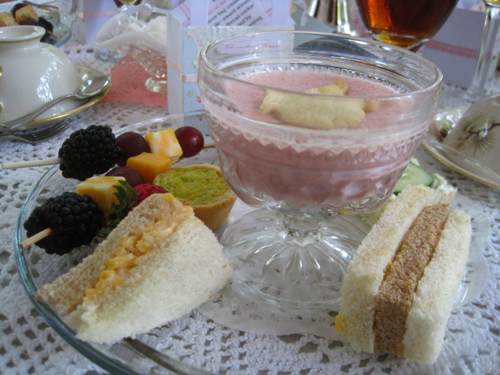 We were also offered iced raspberry tea and hot mint tea, and I had liberal servings of both, which were excellent! Here's a close-up shot of some of the food. It was all delicious, and I'm hard-pressed to say which food was my favorite. I always love quiche, but the finger sandwiches were great, the blackberries were some of the plumpest, juiciest ones ever, the scone was just delicious and reminded me how much I dearly love lemon curd … so let's just say I loved it all! Dessert was as pretty as it was delicious. 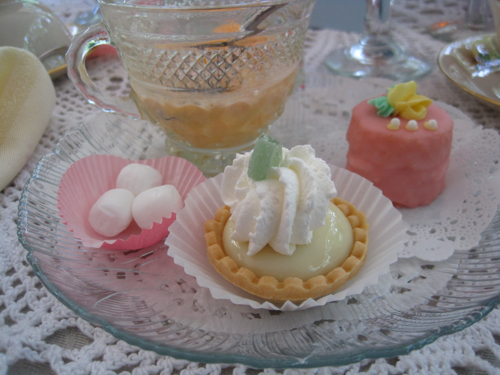 I talked too much (imagine that) and forgot to get a photo of the pretty pastel sherbet in the clear cup, but the other treats included old-fashioned mints, a mini key lime tart, and a beautiful petit four. It was all delicious, but I love key lime anything and definitely enjoyed this tart! As if all those fun afternoon tea treats weren't enough, I got home and realized that volunteer Gloria Downing's triple-award-winning shortbread was tucked into these sweet treat bags that all the guests received. Alas, I ate mine before I thought to photograph it and show you how pretty it was, but please believe me when I tell you those three awards were well-deserved! It was a fine and fitting finale to a terrific afternoon of tea! On Saturday, I had the distinct pleasure of once again serving as a judge at the Senoia Area Historical Society's Tea On The Porch fundraiser. 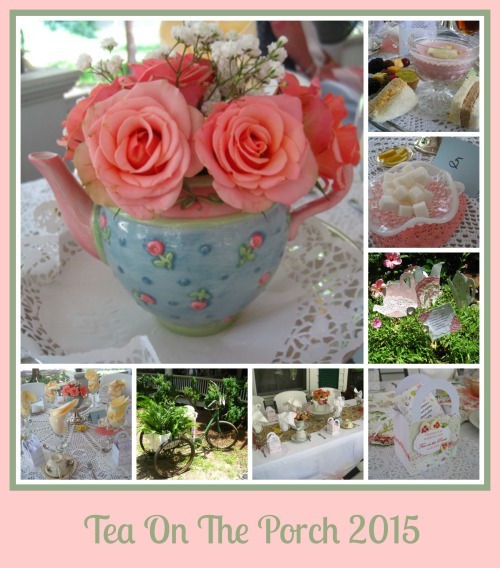 I attended the first event last year and had a wonderful time, and this year the organizers did another fabulous job of creating a beautiful afternoon of friends enjoying tea on the porch! This porch, by the way, belongs to SAHS President Dub Pearman and wife Mary, whose beautiful historic home is a town treasure. 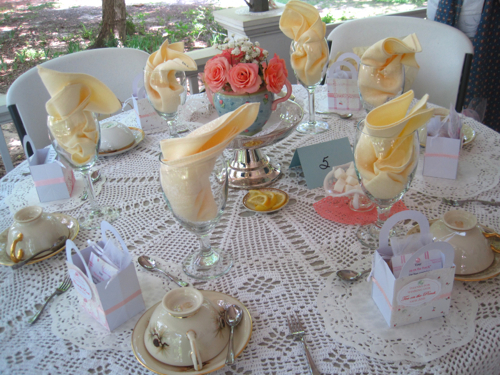 The tables were lavishly decorated with fresh flowers and teawares, and I so enjoyed seeing all these lovely things the Pearmans and the volunteers were willing to share at this event. 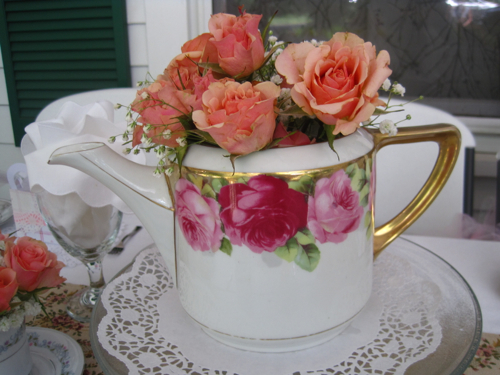 The teapot arrangements were especially beautiful this year, I thought! 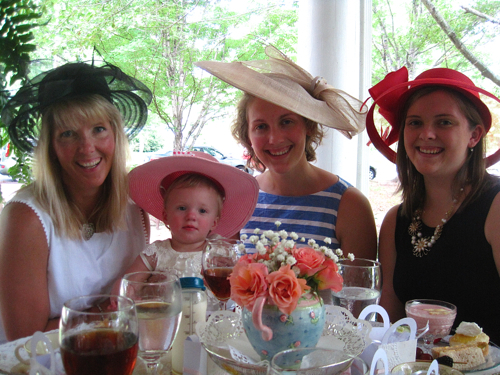 This year's tea was held in honor of the late Mary A. 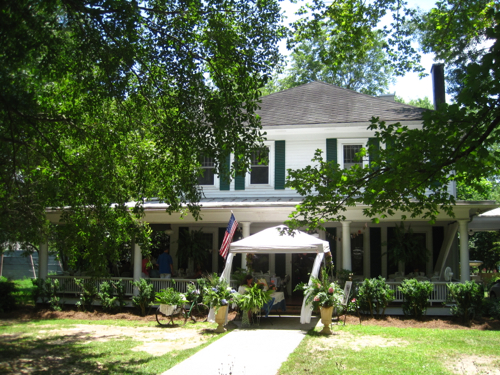 Brown, an entrepreneur who opened the first bed and breakfast in Coweta County, the Culpepper House on Broad Street in Senoia. 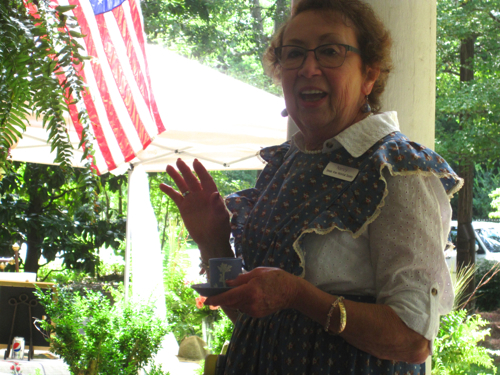 Mary was a dedicated member of the historical society and hosted its first tea at the Culpepper House. It was lovely to see several of her family members at this tea, as well as the current proprietor of the Culpepper House. The SAHS displayed this copy of a 1992 newspaper feature on Mary, which it turns out, I wrote back in my reporter days. Here, my friend Nancy Roy, a tireless historical society volunteer, shares a little about Mary, and she brought along a prized Wedgwood cup and saucer she now owns which once belonged to Mary. The other two judges for the hat contest this year were Corby Winters, at left, a life coach and inspirational speaker, and Angela White, at right, who serves as Zoning Administrator for the Coweta County Planning and Zoning Department. We had a great time! Angela is also in my Sunday School class at church, so I had to behave. A little. I am, by the way, wearing a vintage hat in this photo, but it sat on the back of my head and doesn't show from this angle. It's here, in case anyone wonders. Now last year, I judged the contest along with two gentlemen, and though we quickly came to an agreement about who the winner would be, I knew it would be a different experience to judge a hat contest with two women. 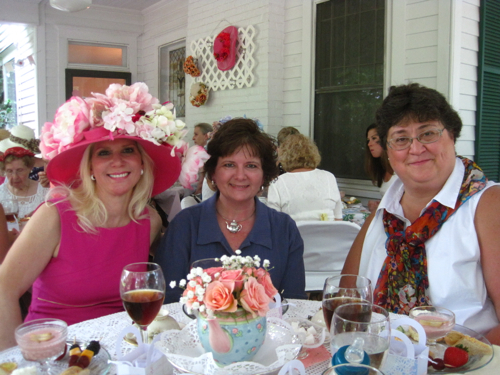 I was pleasantly surprised when all three of us immediately said our top choice for the hat contest overall winner was Judy Belisle, whose fabulous floral and feathered hat with its trailing tulle was such a southern classic. 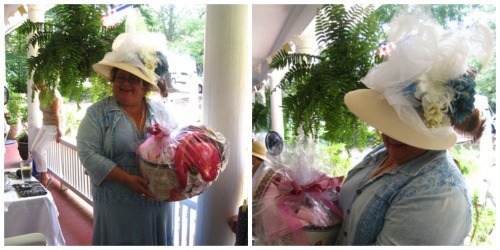 She won a wonderful gift basket as her prize! 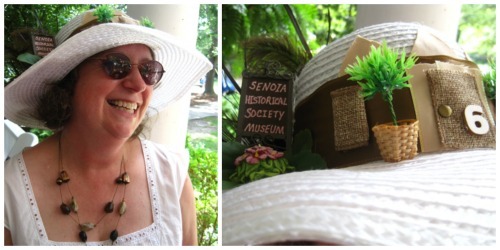 We also agreed that Cheryl Bains, a return visitor who was last year's hat contest winner, deserved an Honorable Mention for her incredibly creative hat paying tribute to the Senoia Area Historical Society's headquarters house at 6 Couch St. in Senoia. Clever! And tomorrow, I'll tell you about the delicious food they served, including an elegant culinary touch that I, for one, intend to copy! Lynn woke and, realizing what day it was, closed her eyes and pulled the sheet up over her head. Maybe she could sleep a few more minutes and postpone the inevitable. But after tossing and turning for ten minutes, she went ahead and got up from the guest bedroom at her father’s house. It was the day she and her brothers were going to move him into assisted living. Her father, Charles, was doing well physically, but mentally, he'd been slipping for months. At first, the dementia wasn't so noticeable. Lynn had stopped by one day around lunchtime to the smell of scorched food coming from the kitchen. "Dad, is something burning?" she had asked. Rushing into her father's small kitchen, Lynn had discovered a tomato soup can on the counter and a small saucepan with the burned remains of soup clinging to the bottom and sides. Her father claimed he had simply gotten busy watching Gunsmoke and forgotten to turn off the soup. Later, he claimed he was distracted because he was thinking about how much he missed his late wife. That excuse might have worked if she hadn't passed away twenty-six years before. Lynn and her twin brothers, Richard and Russell, all lived nearby and tried to check on their father often, but it had gotten to the point that “often” wasn't enough. One evening about nine, her dad’s neighbor, Mrs. Barnes, called. "Honey, I don’t want to worry you, but your father was just outside in his boxers and a T-shirt watering the azaleas. I got him to go back inside, but he seemed confused about what time it was, so you might want to come check on him." After seeing both her teenage daughters off to college the previous fall, Lynn had looked forward to a year of carefree living, maybe taking a class at the community college or finally joining a book group. She hadn’t realized that parenting a parent was going to be one of the hardest jobs she'd ever had. To top it off, she felt guilty for even thinking about herself when her father was clearly in decline. She and her brothers had been preparing for the move for weeks. They had tidied up the neat red brick ranch-style house, knowing eventually they would have to put it on the market, and one of the three spent the night at their father's house every night. Charles knew something was up, and it was making him nervous. The three siblings had agreed they all wanted to be there when their father left the house to go to his new home. 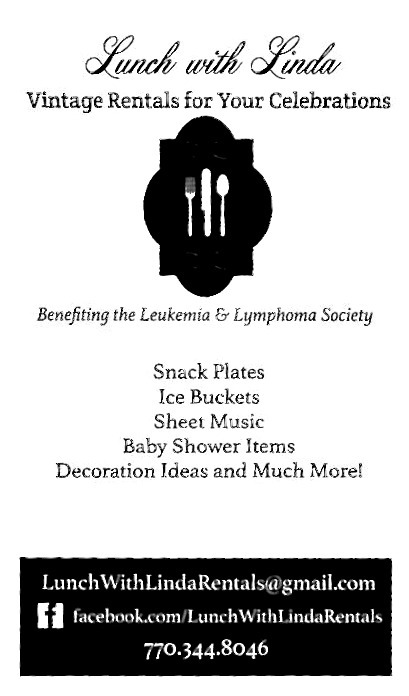 Lynn went into her father’s bedroom and gathered some of his personal items and toiletries, just the few things he would need to help him settle in at Grayson Manor. The assisted living director had advised her not to bring any of her father's valuables with him, but he didn’t have many valuables at that point. He still wore his watch and his wedding ring, but that was about it. Lynn did a fast check of the worn wooden tray where her father had always kept his watch, his spare change, and his wallet. A small wooden box contained a photo of her late mother along with a few other mementos. He would want that photo for sure, and to Lynn's surprise, when she reached inside the box, there sat the gaudy, tarnished old teapot pin he had purchased for Lynn when she was a little girl. Lynn wandered back in time to the late fifties. She and her father had gone to a Father-Daughter Tea at church on the Saturday before Father’s Day. That afternoon, her father took her to Woolworth's to select a memento to mark the occasion. When Lynn spotted the rhinestone pin, she had insisted that was what she wanted. 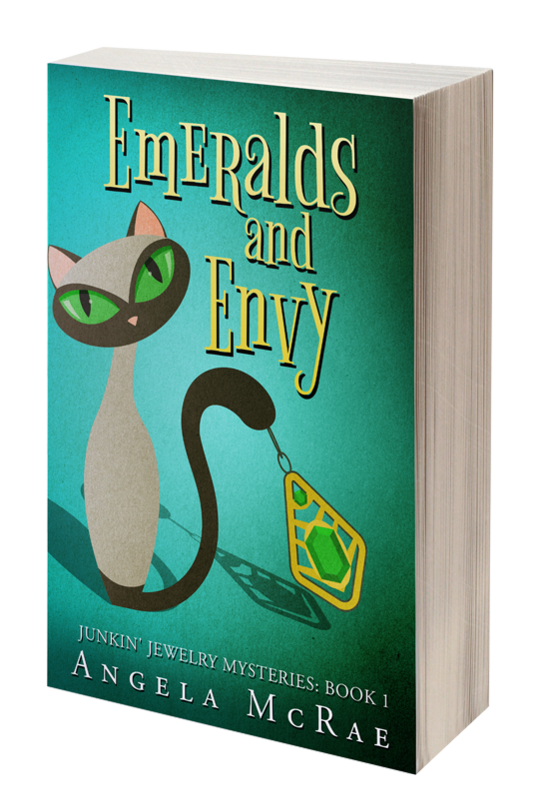 Lynn's father had tried to talk her into getting a nice charm bracelet instead, since those were so popular with girls back then, but Lynn had been adamant about getting that gaudy rhinestone pin. Lynn hadn’t thought of that old pin in years. On a whim, she fastened the piece onto the crisp cotton blouse she'd worn that morning. When she walked back into the living room, her father was watching Gunsmoke. He loved that show, and every week or so he asked if the actor who played Festus was still alive. Suddenly, her father looked her way and got a big smile on his face. Lynn was amazed that her father could, on occasion, still remember something like that—yet he couldn't remember to take his medication at breakfast. Maybe her father was doing better than she thought. Lynn went into the kitchen and poured herself a glass of iced tea. She hoped they made good iced tea at the assisting living place, because that’s all her father would drink with his dinner. She walked back into the living room and joined him on the sofa. Charles looked at her, again staring at the teapot pin on her blouse. "That's a pretty pin, sweetheart," he said. "Is that new?" Lynn swallowed. “No, Dad. It's just”—her fingers flew to the satiny gold surface of the pin—“something I’ve had for a while,” she said. There was a knock at the door, and Lynn opened it to find Richard and Russell standing there, looking just as nervous as she felt. “Are we ready?” asked Richard. Russell, who had always been closest to their dad, looked on the verge of tears. She touched the teapot pin again, recalled the happy memories of the past, and told herself that maybe there was still time to make a few more. When I went to the party in North Carolina last weekend for the small press where I edit fiction, I had no idea it was something of a tradition for one staffer who reviews lots of products on Amazon to bring some of the freebies he receives to share with all of us. Through a drawing conducted "Dirty Santa" style, some great goodies were given away, including two tablet computers, a Kindle, fabulous sets of stainless steel knives and utensils, and electronics gadgets galore. My husband won a Google phone, and through a strategic trade and a kind author who doesn't cook, I am now the owner of a lovely new digital kitchen scale. 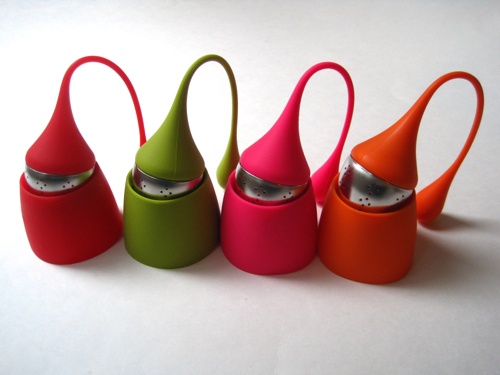 Someone else won these tea infusers and didn't think they'd use them, and since I'd mentioned my love for tea, these also got to come home with me! 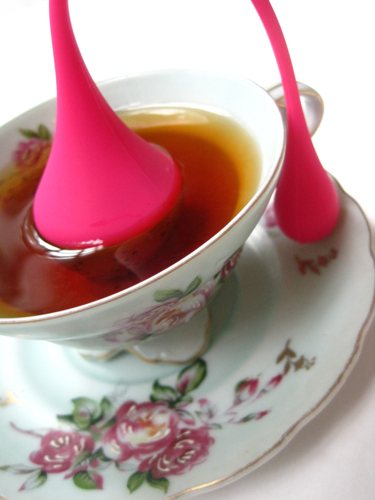 These silicone tea infusers are by a company called the Friendly Swede. 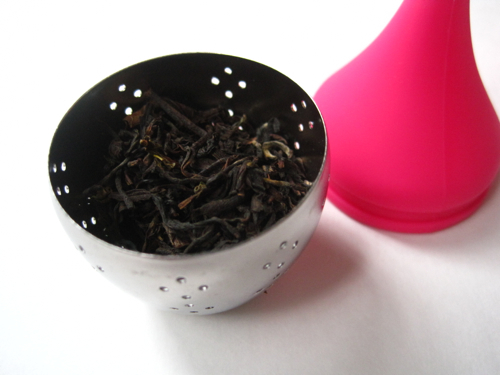 I tried this pink one, and the silicone part popped off easily for me to add some Darjeeling tea leaves. I am not particularly worried about silicone getting in my hot tea since I don't use such infusers that often, but for those who do worry about that, I thought it was nice that the stainless steel is actually just about all that sits in the tea. The infuser worked well, sits nicely in its base when you're through with it, and cleans up quickly as well. This set was a fun gift to receive! 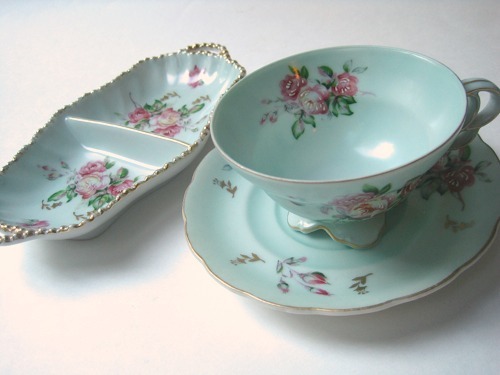 Some gorgeous aqua teawares have a new home! So I'm going out to check the mailbox one night this week when, off to the side of the front door, I spot a large cardboard box sitting in my empty planter. Did I order something and forget? I don't think so. Then I see that it's from Margie, a longtime tea friend and reader of this blog in California. 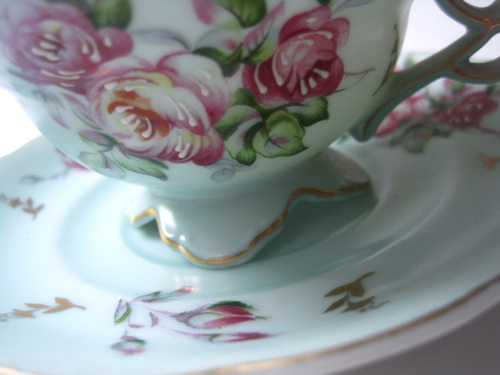 To my delight, she has gifted me with some gorgeous teawares in the prettiest pale aqua color I've ever seen. These are such elegant and detailed pieces! Isn't this cup and saucer set just exquisite? 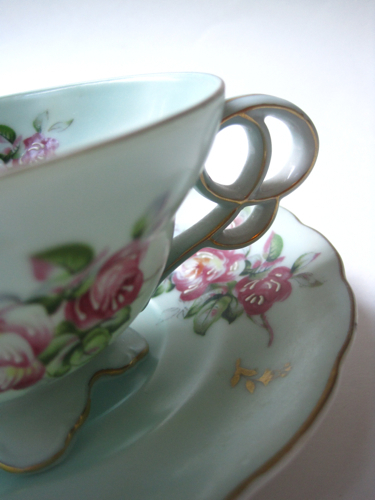 I have a real "thing" for a teacup with a pretty handle, and this may well be one of the fanciest ones I've ever owned! 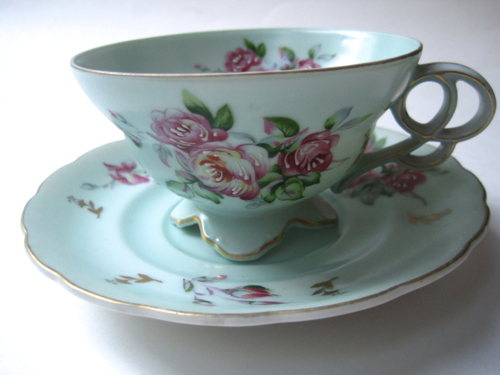 And look at the base of this elegant footed teacup. Lovely! 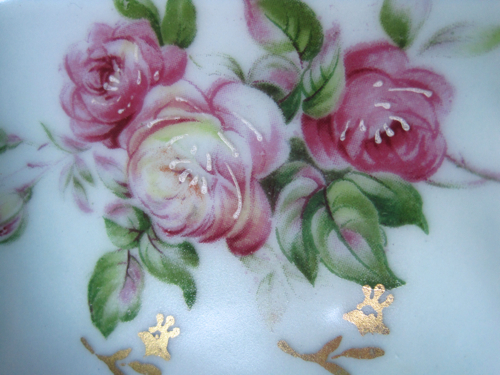 Here's a detail from one of the rose designs on the tidbit dish. You can even feel the raised white paint from the highlights on the roses. 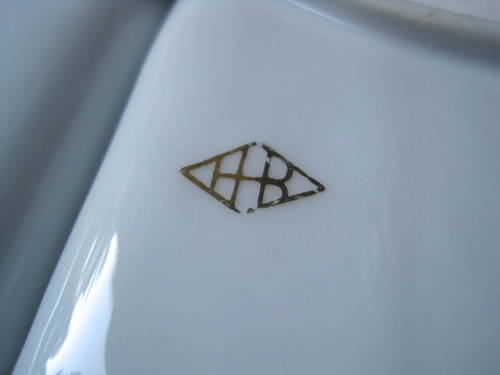 The cup and saucer are both unmarked, but the back of the tidbit dish has this backstamp, which is a new one to me. Now I have something new to research while I'm enjoying my beautiful and thoughtful new gifts from Margie! 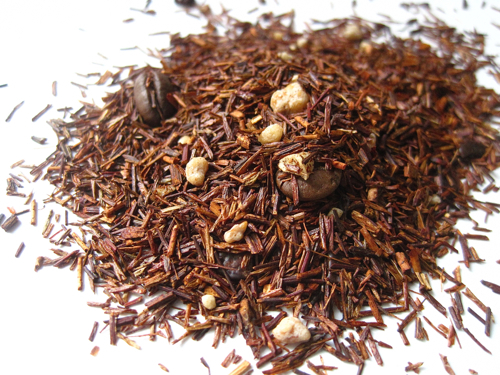 Okay, smart people, do you notice an unusual ingredient in the new rooibos tea I got from Tin Roof Teas in Raleigh, N.C. over the weekend? If you said "coffee beans," you are correct! That's one of the surprise ingredients in this delicious tea I bought "by scent" after sniffing several jars of tea at this lovely tea shop. As it says on the package, this tea contains rooibos tea, chocolate chips, brittle pieces, cream caramel pieces, freeze-dried yogurt granules, roasted coffee beans (! 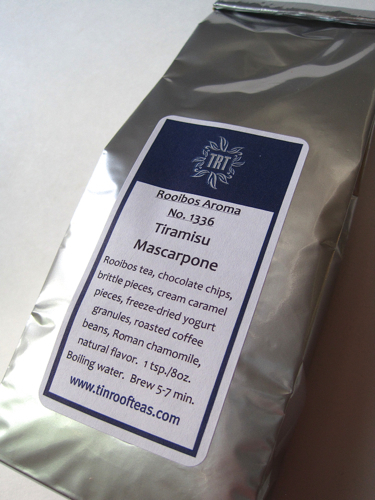 ), Roman chamomile, and natural flavor. A seven- to eight-hour road trip like the one I enjoyed over the weekend results in quite a few stops along the way for refueling of both cars and humans. 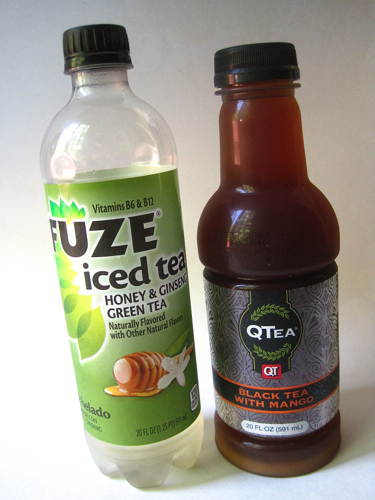 I love to look for new bottled teas to try when I'm visiting convenience stores. I'm a pay-at-the-pump girl when I'm at home (no temptation to buy junk food and candy that way), but on the road, I'm game to try new foods and beverages. 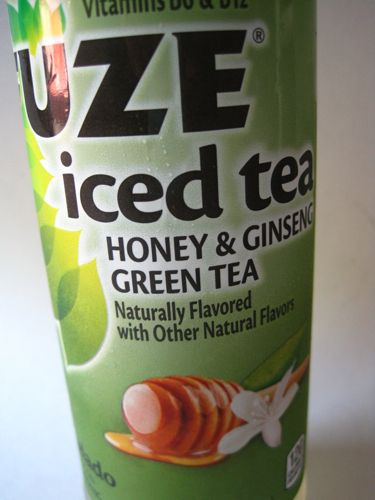 The first new tea I tried this trip was this Fuze brand "iced tea" (no ice was in the bottle!). This one was a green tea blend with honey and gingseng, and it was a bargain at 79 cents. It had a lightly sweet taste with subtle honey and ginseng flavors. Although it was sweetened with high fructose corn syrup, which I know some people avoid, it was just 120 calories for the whole bottle, which I didn't think was bad, especially since I didn't drink it in one sitting. And I actually got a fountain tea drink at the QT store to go along with a slice of pizza (delicious!) for supper one night. That store must have had 10 different tea selections at their fountain, with both sweet and unsweet versions in every combination you could imagine. They had plain sweet tea, unsweet green tea, sweet green tea with pineapple, berry flavored black tea, and more. 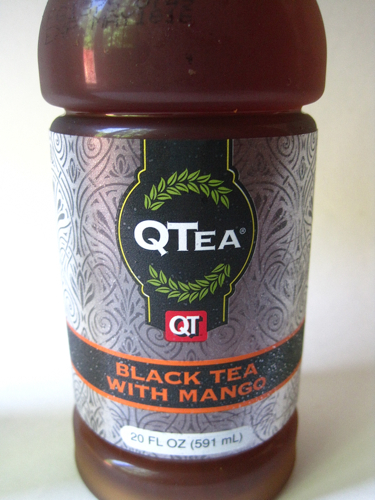 I got the sweet black tea with mango at the fountain, and I took a sip and liked it so well, I bought the $1.29 bottled version, too, mainly because I admire the clever name: QTea. This tea contains water, sugar, natural flavor, citric acid and black tea, and it's higher in calories, at 200 calories for the whole bottle, but again, I enjoyed it over several meals. Do you try new things when you are on the road? And do you try new bottled teas when you're on the road? Happy 3rd Birthday, Daphne's Diary!